The outside of a Mansfield toilet can look sleek, smooth and stylish. But it’s the inside of our toilet where you’ll find the true beauty of the operations. The majority of residential toilets rely on gravity to work. When you flush the toilet, a device called the flush valve inside the toilet tank opens a channel that lets water go down into the toilet bowl. The quantity, weight and velocity of the water going from the tank to the bowl is what creates the flush. The key parts inside a toilet are the fill valve, which refills water into the tank and the flush valve, which allows water to go from the tank to the bowl. A flush lever outside the tank triggers parts inside the tank to work. “The design of the bowl is very important in helping move waste efficiently,” says Miller. “For example, the DenaliTM Power Flush toilet is designed with dual side jets to intensify the efficient removal of waste. During the flushing process, energy picks up as water moves through a three-inch flush valve to reach its highest velocity earlier in the flushing cycle. Miller reports that the ceramic pieces making up the tank and bowl are also critical in the overall long-term success of a toilet. She points out that thicker, heavier bowls, like those made in the United States by Mansfield, are often more robust and reliable than those imported from foreign countries. Additionally, how the tank is secured to the bowl should be carefully addressed. 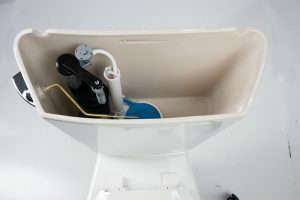 At Mansfield, the SmartFastenTM system includes a three-bolt tank-to-bowl connection to assure perfect alignment and a leak-proof toilet.